Ok good… because here’s a cool event going on this weekend that supports our farmers! Bring your lawn chairs for some outside BBQ, beer, and bluegrass!! FREE STREET FESTIVAL – Saturday, April 4 Rain or Shine! $5 beers & BBQ sandwiches on the street. 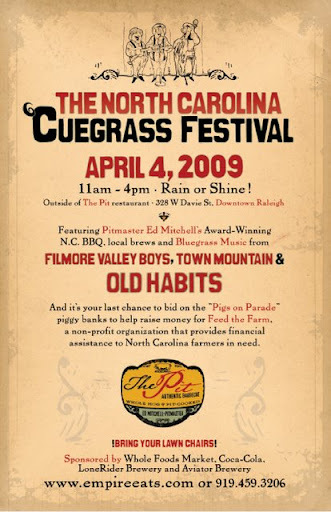 Proceeds benefit Feed the Farm, a non-profit organization helping to raise money to provide financial assistance for NC farmers.